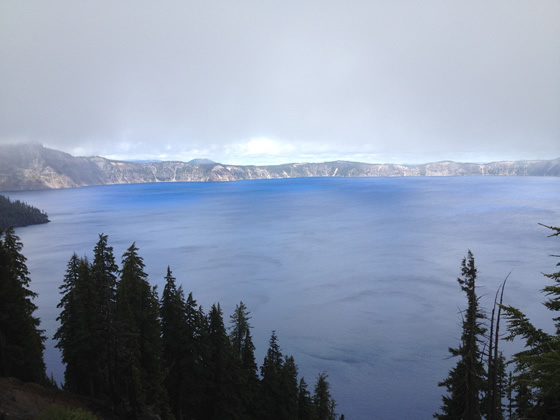 The first stop in our road trip was Crater Lake National Park, located in southern Oregon. Crater Lake, the centerpiece of the park, is a caldera lake formed by the eruption of Mount Mazama 6-8 thousand years ago. The lake has no inlets and outlets, and gets all its water from precipitation and loses water via evaporation. With a maximum depth of 592 meters, Crater Lake is the deepest lake in the United States, and is known for its radiant blue color. 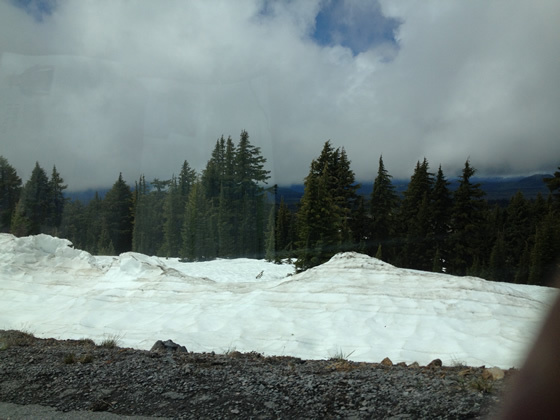 Look at all that left over snow at Crater Lake. Most of the attractions in the park are located along the Rim Drive, which is a road that goes all the way around the lake. When we went there, the Rim Drive was not completely open because there was still considerable snow. The elevation around the rim of the lake is 7000-8000 feet above sea level, and at some points there was still a foot or two of snow on the ground. The weather wasn’t the greatest and was foggy, cloudy and sometimes rainy. However, Crater Lake was still quite the beautiful sight from the various vista points on the Rim Dr., especially when the sun peeked through the clouds. Due to the clouds, we didn’t quite see the famous radiant blue color of the lake until we got to Rim Village in the southern end of the lake. The combination of the radiant blue and the cliff edge of the rim makes for quite the beautiful sight. The scenery was somewhat surreal that it looks like a painting. I’d imagine the lake would look even more brilliant if we had sunny clear-blue skies. Hopefully next time I go back the weather will be nice and the whole Rim Drive will be open. 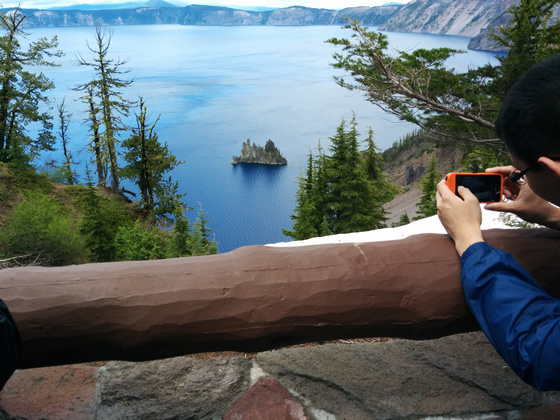 Here’s me trying to take a photo of the Phantom Ship (the little island) in Crater Lake. 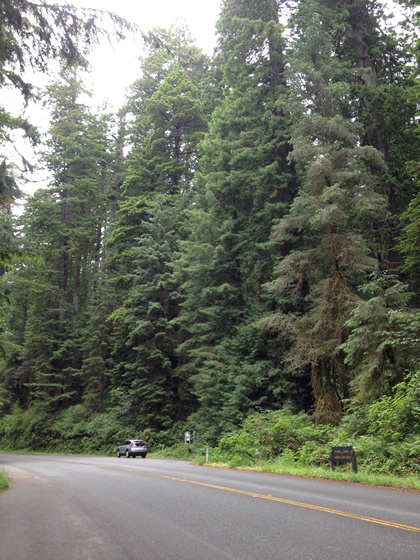 The Newton B. Drury Scenic Parkway is lined by imposing redwoods. From southern Oregon, we drove down to California’s northern coast to visit the giant coastal redwoods. Existing only on the northern California coast, the coastal redwoods are the tallest trees in world and among the largest, capable of reaching over 100 meters in height. Much of the big redwoods were lost due to logging, but now some of the old growth forest is protected by the Redwood National Park and several California state parks lying along US Route 101 which is sometimes called the Redwood Highway. This portion of the trip was highlighted by two scenic drives: the Newton B. Drury Scenic Parkway in Prairie Creek Redwoods State Park, and Avenue of the Giants in Humboldt Redwoods State Park. Magnificent 50+ meter tall redwoods line the sides of these routes and cover up the sky with their foliage. 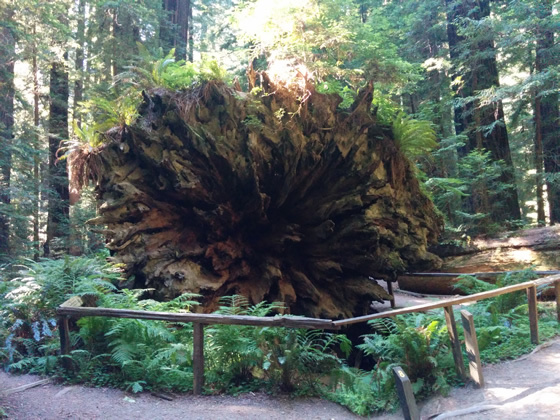 Of course, we stopped by and walked some easy trails to see the redwood groves and some especially large trees up close. Walking among these ancient and gigantic trees was a humbling experience and just shows how small we are in comparison. 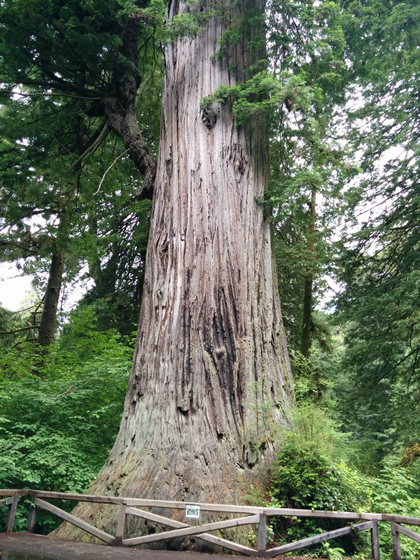 The Big Tree at Prairie Creek Redwoods State Park is one of the biggest trees we saw on this trip. 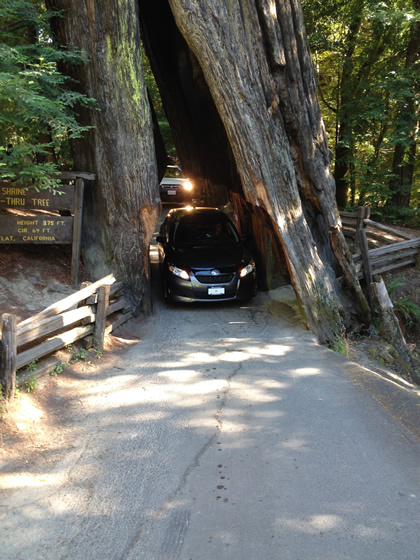 There are three redwoods in the area that one can pay a fee to drive a car through. We visited the Shrine Drive-Thru Tree at Meyers Flat, which is inside Humboldt Redwoods State park. My parents’ Toyota Matrix is a compact car, so it had no trouble going through the opening at the bottom of the tree. Some larger vehicles had to be driven a lot more carefully to avoid scratching the side mirrors. Our little Toyota Matrix making its way through the Shrine Drive-Thru Tree. In addition to driving and strolling through the old growth forest, we also stopped by some of the view points and a beach along the northern California coast. I haven’t seen the Pacific Ocean in a while, and it’s good to feel the ocean breeze on the West Coast. 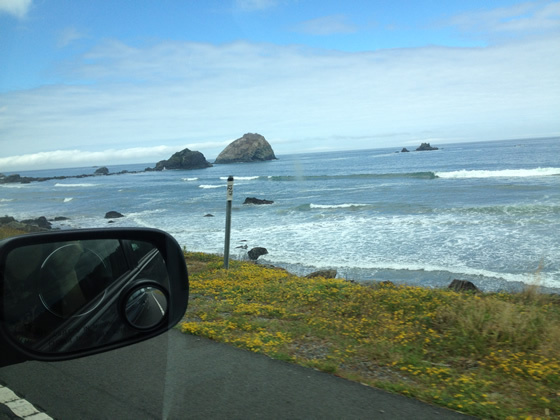 Driving further down Route 101 led us to San Francisco and the Bay Area. We haven’t been to San Francisco for more than a decade. The last time we were there, we drove into the city and walked around in a small area near Chinatown, so there were quite a few tourist spots that we haven’t visited. San Francisco is known for its cool and foggy weather even in summer, but we were greeted with warm and sunny weather during this visit. All the better for us. San Francisco has some really steep slopes. 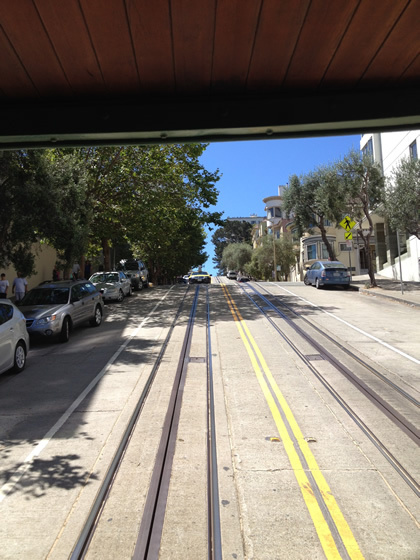 Unlike the last time we were there, we took advantage of the public transit system and finally rode San Francisco’s famous cable cars. The cable car’s are quite different than riding a bus, and it looked like it takes quite a bit of work for the driver to control the brakes. Taking public transit really gave us a sense of how hilly San Francisco is. Some of the streets have serious slopes on them, and controlling a cable car or driving a bus in the city is not so simple. Partly because of the steep slopes and partly because of the number of people on these cable cars, we didn’t ride the cable car by hanging on to the poles on the outside. 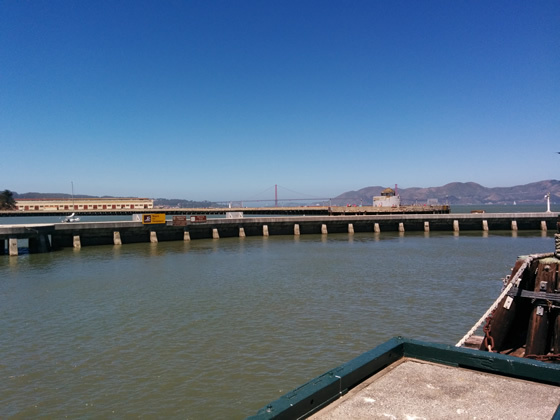 Using the public transit, we went to the Hyde St. Pier and Fisherman’s Wharf. We didn’t try out any of the seafood at the wharf, but the view from pier to Alcatraz and the Golden Gate Bridge was nice. We ended up eating at San Fran’s Chinatown. San Francisco has one of the largest Chinatowns, and it seems less crowded and cleaner than the Chinatown in NYC. The Chinese food there was quite good, and the price was very reasonable. 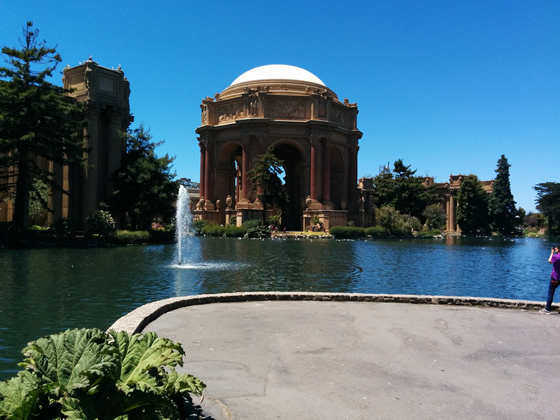 After lunch, we went to the Palace of Fine Arts up north in the Marina District. The name sounds like an art museum, but the place is really a park with a landmark. And what a landmark it is. The structure itself with the large rotunda and the whole park with the small lake were beaming with elegance, especially under the bright blue skies. Afterwards, we went to the famous Lombard St. at Russian Hill as our final stop in the city. That particular block of Lombard St. is the famous zigzag street that people see when they search for images of San Francisco. The slope is steep enough that the street has only one lane in one direction and to zigzag its way down. Thanks to the zigzag shape, there is some extra space on the street that’s usually filled with flowering plants. We were hoping to see some cars trying to go down the zigzag street, but on the day the city closed the street to general traffic because there were so many tourists around. On the upside, we were able to walk up and down the zigzag path ourselves. We then left San Francisco, but we made one more stop in the Bay Area and visited the campus of Stanford University. Stanford has the reputation of being one of the world’s best universities and rivals the Ivy League schools in the Northeast. Also, I heard from friends that the campus is very well appointed and always wanted to visit. 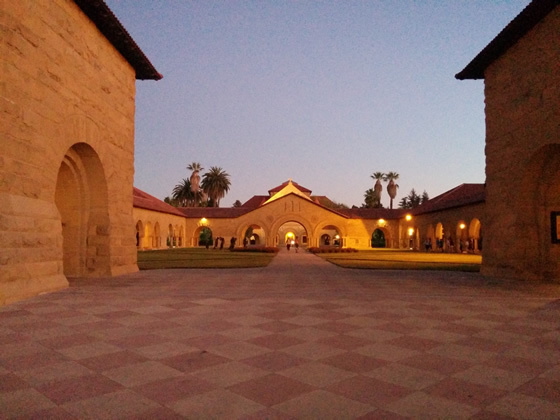 We got to the Stanford campus a bit late in the day when it was started to get dark, but we could still see that the campus is very beautiful. I like that the building style in the campus is very consistent with the sandstone colored walls and red roofs. The whole campus feels very… Californian. Since I didn’t see the campus during the day or see much of it, I can’t say whether I like Stanford better than some of the other university campuses I’ve been to. Hopefully I’ll have a chance to come back and have a better look at the whole campus during the daytime. Stanford’s sandstone colored campus. Too bad it was already getting dark.